To achieve continuous growth, every business needs big ideas to innovate. And one such big idea that gave Vishakha a big leap in business was the introduction of Big Bins. These Big Bins are our humongous, branded storage bins that were introduced in India for the first time by us. We also have the privilege of having Indias largest injection-moulding machine of 3,800 tonnes, which makes these strong, highly durable and large capacity bins from advanced polymers. We at Vishakha Industries are one of the leading manufacturers of cutting-edge products in material handling, storage & transportation system. Our company has grown in leaps and bounds since its inception in 2006 and, in just a short span of time, has become a frontrunner in the industry. We specialise in large injection moulding and the privilege of having India’s largest injection moulding machine with a massive capacity of 3,800 tonnes.Our state-of-the-art manufacturing facility in Baddi, Himachal Pradesh, India, utilises one of the most hi-tech mechanised systems, which also includes a robotic material handling system. 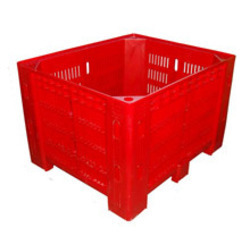 With a very focused and streamlined approach to production, we manufacture injection moulded extra large, heavy-duty crates (Big Bins), small crates and pallets that are extremely tough, exceptionally durable and very easy to handle. Also manufacturing Blow moulded articles.